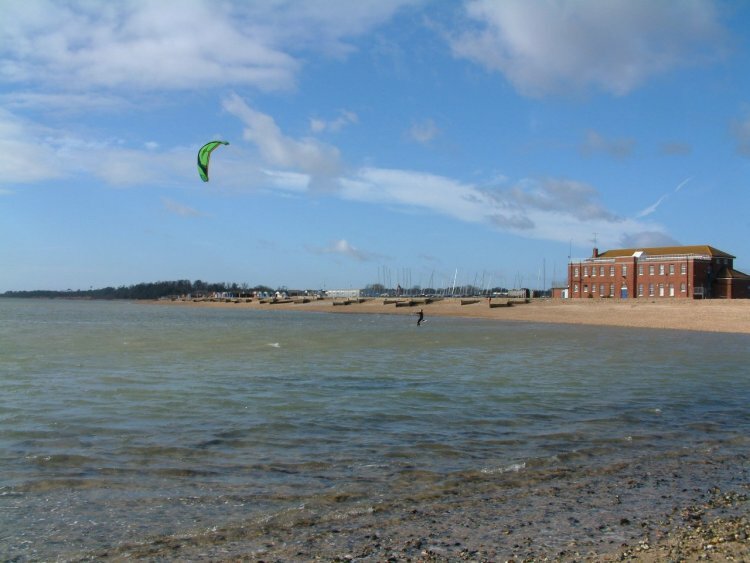 Calshot Spit is a great location for kitesurfing (and windsurfing/SUP/kayaking) with a variety of sailing conditions from butter flat water to rolling swell at high tide. The spit is divided between two different local authorities – the area along the beach huts, up to the activity centre entrance, is part of New Forest District Council. The grounds of Calshot Activity Centre are controlled by Hampshire County Council. Kiting from the official ‘kite beach’ in the HCC Activity Centre is by annual club membership only. Kiting from the NFDC ‘car park’ between the beach huts is unregulated at present. If you choose to kite Calshot without joining the Club, please do so respectfully to help us maintain access for kiting at this location. Wind directions that don't work anywhere at Calshot are NW or W. Basically the wind is off the land & the power station blocks it in a NW. 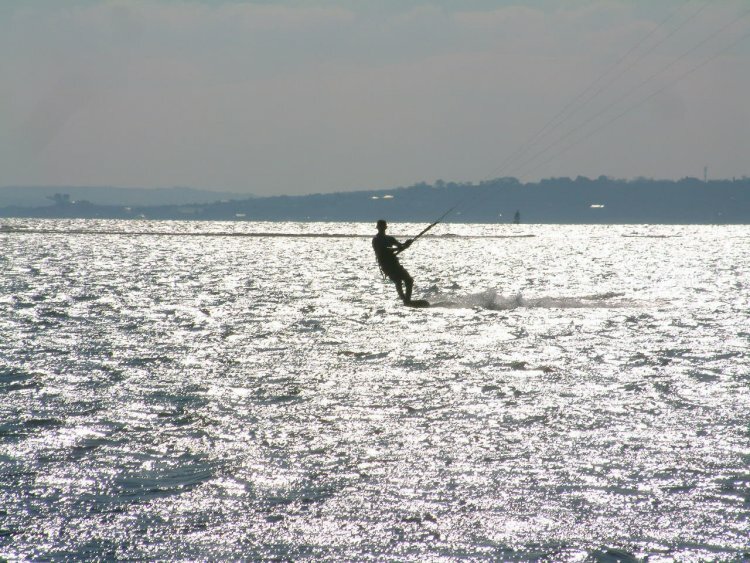 Local kiters go to Lepe Beach in a W or over to Meon Shore in a NW. Nomadic Kitesurf sometimes offer a boat service to Meon if they are teaching there. There is no room at the car park spot to launch at high tide. It's sketchy at best so be careful. Calshot offers up a variety of sailing conditions from butter flat water to rolling swell at high tide. Something for everyone! Nearest convenience store is in Fawley Village. Pond - Accessible for kiters between 1st November & 31st March. The launch for the pond is from the beach by the Sopwith hangar (members only), or over by the power station (public). Only kite at high tide. The bottom is muddy & you need to be able to stay upwind. Don't overfly the road on the southern side of the pond. Even if you're not a member, PLEASE respect the summer closure on the pond. Kiting from the beach huts car park requires no permit; you pay to park between April & November. Hot showers, toilets & changing facilities. Cold water shower/kit wash on the beach. * Members are required to be a minimum of BKSA level 2 or equivalent - i.e. you should be kiting safely & independently. Membership is available from the Activity Centre Reception or 24-7 Boardsports. The shop stocks a wide variety of kite, windsurf & SUP kit. There is also plenty of demo gear on the water, just ask. There is a live wind meter display in the shop. The shop has tea/coffee facilities for staff & customers - though if you're going to put the kettle on the staff will expect a brew if not cake/biscuits. If you're stuck for a launch ask in the shop, but they don't like to go out in the rain. There is a kite school, Nomadic Kitesurf, operating from the beach if you want lessons or coaching. The school has 2012 gear & a RIB so they can teach in any wind direction. Indoor dry ski slope (with loads of ramps & rails on a Wednesday night). Huge & extremely popular indoor climbing facility. Spinnakers Bar for post kitesurfing refreshment & excellent Thai curry. There's more information at the Calshot Activities Centre website. The space for launching at kite beach is not that big if it’s busy. Keep it tidy & wind your lines up if you’re not going out. There is no landing on the beach further east of the windsock - there's basically no beach, just the sea wall. Kite beach will be closed (red flag flying) at high tide in a SE onshore wind. The kite beach itself is relatively free of obstacles. There are however several large buildings next to the beach so be aware of wind effects. There are some submerged concrete blocks in front of Houston House, but these are clearly marked by a green buoy. From the car park there are groins, cars, beach huts & the general public to dodge - especially in the summer. To the east of the spit, up Southampton Water, is a busy shipping lane. It’s well marked - don't kite in it. There is a lot of water moving around the spit. Wind with tide will make it hard to hold your ground once the sand bar is covered. Calshot is popular with worm drowners. They don't like kiters, stay clear. Ask at 24-7 Boardsports for a tide table & current site information. From M27, off at J2, follow brown tourist signs to National Motor Museum, on A326 follow brown tourist signs to Calshot Activities Centre. Turn left at beach huts & go steady up the road. Car park on your right between the beach huts. Activities Centre entrance at the end of the road. 24-7 Boardsports is the small white building on the right. Park on the grass on the left. Postcode for sat nav purposes is SO45 1BR. Update: August 2013 - New Forest District Council now charge to park in their pay and display car parks even in the winter - that's the car park near the beach huts where non-members of the activity centre can park to launch. Thanks to Lucie Williams for the updated info. 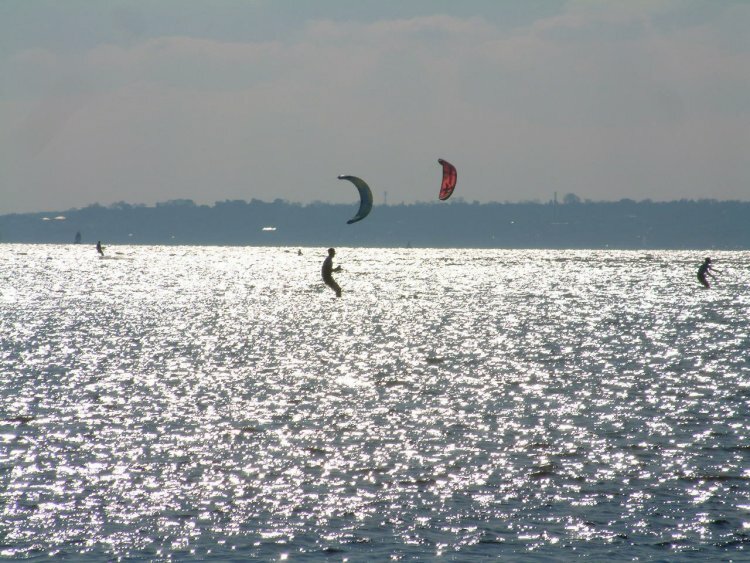 If you've not been to Calshot before go & say hello to the guys at 24-7 Boardsports & get their advice on where to kite. www.surfersoft.co.uk - Compilation of all the local live sites, tide times & flow data. Thanks to Jon Popkiss for this photo.